Vitax Nippon Ant Bait Station is a pre-baited station and is clean and simple to use. Simply twist the base of the station to open the access holes and place on a flat surface as close to the entrance of the ant nest as possible. The bait is designed to encourage the worker ants to take the bait back to the nest to feed the rest of the colony and kill them in the nest. 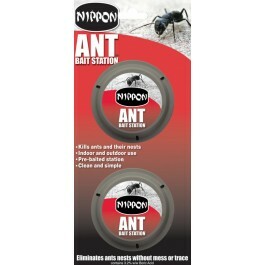 The Nippon Bait Station can be used indoors and outdoors and should be applied at the first signs of ant activity. Do not disturb ants when feeding. An effective dose is normally built up in 7-10 days. Clean and simple to use. Kills ants and thier nests. Full range of Vitax Nippon pest control products available from stock.